Steven (Chicagoland, United States) on 27 September 2011 in Landscape & Rural and Portfolio. 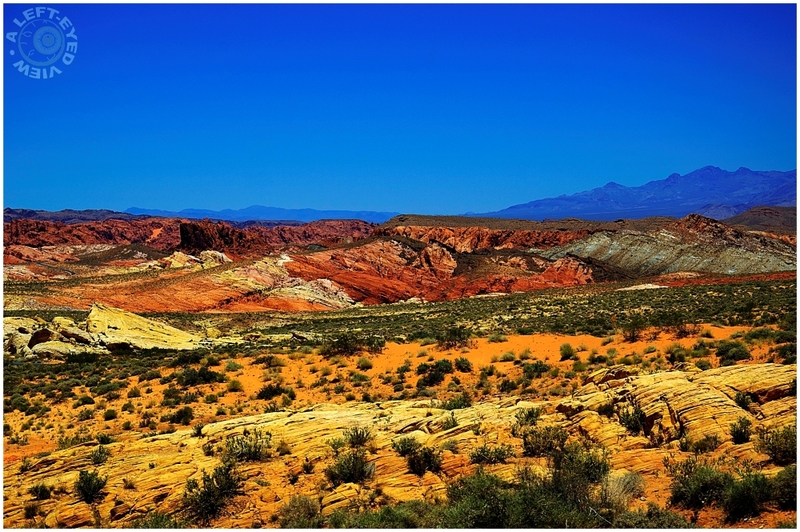 Rainbow Vista is a lookout over the north part of Valley of Fire. It looks north toward the White Dooms and Duck Rock areas. The colors of the sandstone is more of a range of yellows with an occasional red area. This is in contrast to the rest of the park where the sandstones are entirely or mostly red. In many places the reds, gold and yellows are mixed and blended in, looking like they were stirred quickly. The blue sky completes the effect - fabulous! fantastic view into this gorgeous landscape - and I agree with MissT: the blue sky is the perfect contrast to the sandstone. Love the colors, beautiful scenery! The colors are really amazing; and you always have these wonderful skies. Absolutely beautiful.. I dont know how you process your photos.. these are amazing. Colors are really wonderful. I love ! Incredible colors of this beautiful landscape ! Stunning. Great focus throughout and wonderful clarity. Wow - the painted desert - a stunning panorama. @Stephen: I love your description Stephen. I may just rename my second post of this. Fantastic combination of colors, and an absolutely breathtaking shot Steven - well done! What a landscape. You do it justice with these crisp and colorful photos. Both the cool and warm colours were captured beatifully. this color are really an "eyecatcher" SUPERB!!!!!! A very nice palette of red/orange/yellow colors against this gorgeous blue of tfhe sky. Great landscape, Steven. The colors here are breathtaking. Just beautiful! This is a wonderful composition! 5*'s! Beautiful pic, beautiful place, well-named. wow! the colours, light and details are simply stunning here! beautifully taken photo!